Heavy metal guitar enthusiasts rejoice! The world will soon be able to experience the stunning new album from guitar legend and classical metal master Yngwie Malmsteen. "Relentless" will hit streets on November 23 via Malmsteen's own Rising Force Records. The CD contains more than 60 minutes of brand new material and showcases the guitar great at his best with the signature virtuosity and mind-blowing technical speed for which he has come to be known. 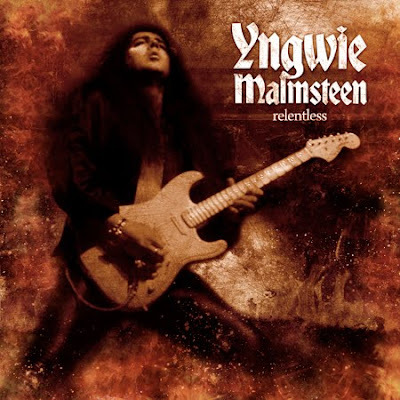 "Relentless" also features striking vocals from Tim "Ripper" Owens (JUDAS PRIEST, ICED EARTH), who first collaborated with Malmsteen on 2008's critically-acclaimed "Perpetual Flame" (Malmsteen's first album for the Rising Force Records label). Of the new album, Malmsteen commented, "The album title really says it all. The drive to surpass my own accomplishments can best be described with one word — relentless. After all these years of composing and playing music, I still am passionate about pushing myself to the limit — to the highest, most demanding level of playing possible."